It's not fair for me to review of a book containing essays about geektastic entertainment mastermind Joss Whedon's contributions to pop culture. There's really no way for me to be objective about this collection because I'm an unabashed Whedonite. Think überfan. In 1997, I sat down and watched my first episode of Buffy The Vampire Slayer, mainly because it was Saturday afternoon, I was home, and I didn't want to go jogging. I watched an episode about a cheerleader who beat the crapski out of a gang of vampires, all while being sarcastic and super funny the whole time. Ok, I thought. Clever. I like clever. Then I watched a few more episodes and realized that this quirky little horror/action/comedy was also extremely well-written, and dripping with pathos. I quickly became a major Buffy fan. Then a couple years later, an Angel fan. Then Firefly, winner of the Cancelled Too Soon Award. Then during Hollywood's writer's strike, someone pointed me towards Dr. Horrible on YouTube. Even the disjointed Dollhouse enthralled me. Hell, I even followed Whedon into the world of comic books. And of course last month I was all over The Avengers, Whedon's most recent writing/directing film success. So truly, I'm not the most objective person to review a book devoted to all things Joss. Dividing Whedon's career one iconic creation at a time, Joss Whedon: The Complete Companion (Titan Books) taps a roster of very professorial-sounding writers to wax intellectual about their favorite show, character, or storyline. Most of the contributors have PhDs. The essay titles themselves sound pretty pretentious, I have to admit: "Buffy And Dollhouse: Visions Of Female Empowerment And Disempowerment." "The Death Of Utopia Firefly And The Return To Human Realism In TV Sci-Fi." "Heroic Humanism And The Humanistic Heroism In Joss Whedon's Shows." There are essays on Feminism, Masculinism, Religious Studies, and Psychology. Some are accessible for those of us who – ahem – are more used to reading Cliff's Notes for class. Others are a bit more dense. The table of contents sounds like required reading for the coolest course on campus, but you need to enroll willingly to enjoy the book. 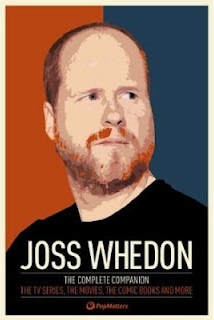 If you already worship at the altar of Whedon, you'll love this stuff. You'll get a kick out of seeing how highbrow intellectual types dissect minor characters and plot minutiae that you and I could totally identify in a Whedon Geek-Off. If this isn't your pop culture area, this won't work for you. The Complete Companion isn't a primer meant to introduce you to the Whedonverse. It's for those of us who already live there.